Testing a tank in this way checks for permanent expansion or overexpansion of the tank walls, indicating unsafe structural deficiencies. All testing is done within a water jacket to ensure safety in case of a catastrophic tank failure. 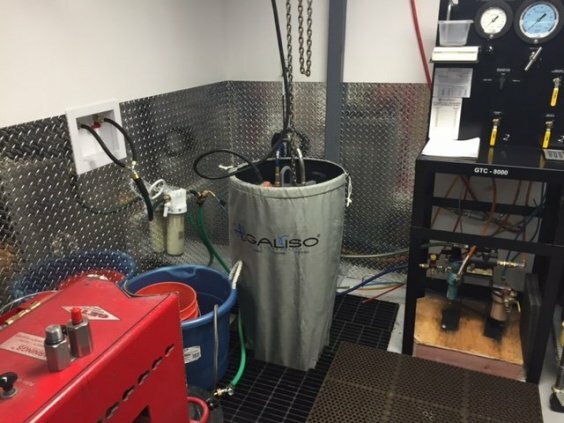 Why is hydrostatic testing necessary? Because it’s the law! Pressure tanks (including all SCUBA tanks!) are regulated by the Department of Transportation. Every tank must pass an initial DOT certification, visual inspection, and hydrostatic test prior to being sold, and before being filled. How often do my tanks need to be tested? The DOT mandates a new hydrostatic test every 5 years after the initial test, some special tanks are 3 years hydro tests. Visual inspections are required yearly on scuba cylinders. What are the common reasons for tank failure? If my tank fails, can I still use it? DOT regulations states that a tank that fails during hydrostatic testing cannot be filled again, and will not be given a test stamp. No reputable dive shop will fill a tank without a hydro test stamp. The tank serial # is stamped out with an X, and the cylinder threads are scored so that it cannot be filled again.